Rather than focusing on the opportunities for the Harvard students graduating in front of him, he urged the students to ignite opportunities for those less fortunate. And instead of shying away from the fact that technology is creating new challenges for the underprivileged, he said we need to address head on automation’s impact on employment. Zuckerberg dropped out of Harvard his sophomore year in 2004 to scale up Facebook as it rapidly grew. 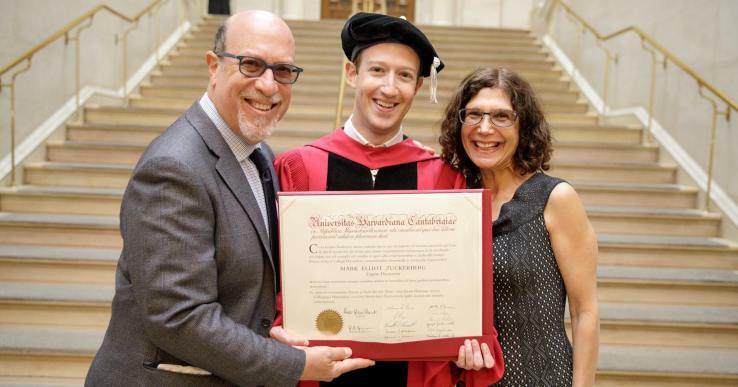 But today he was awarded an honorary Doctor of Laws degree, apparently to the delight of his parents, and became the youngest commencement speaker in Harvard’s history. To grow his understanding of how to build global community, Zuckerberg’s annual personal challenge for 2017 was to visit and meet new people in every U.S. state he hadn’t already visited. Many have described the similarity of his tour to how politicians “shake hands and kiss babies” as they campaign for election, stoking speculation that Zuckerberg might run for president of the United States. Zuckerberg has repeatedly denied this is his plan. Yet with 1.8 billion users, Facebook’s citizenship dwarfs that of the U.S., and Zuckerberg’s choices directly impact the way people socialize, organize and do business every day. Perhaps getting to know a wider swath of those users in person so he can serve them through Facebook’s product is plenty reason for the cross-country trek. The empathy he’s developed on his trip shone through in the narrative of inclusiveness wound through his speech. Zuckerberg began with a couple of corny jokes about how the students at “the greatest university in the world” had “accomplished something I never could.” And while he might have built Facebook in his dorm room, it was its predecessor “FaceMash” that had the biggest impact on him. That’s because the app almost got him kicked out of Harvard, and at the premature going away party his friends threw him, he met his future wife, Priscilla Chan. Then the Facebook CEO launched into the meat of his talk about the idea of purpose — not just finding purpose for one’s self, but giving others the chance to have a true purpose. He broke down his strategy to achieve this goal into three parts. Putting a man on the moon seemed like an impossibly large challenge at first, but through the contributions of a legion of not only scientists, but support staff, politicians and tax payers, we accomplished that feat. It not only paid technological dividends, but created jobs, too. The biggest challenge with big projects is getting started, he says, but we must persevere. Climate change might seem like too large a goal to know where to begin, but Zuckerberg suggests we put people to work installing solar panels. The Chan Zuckerberg Initiative has put $3 billion toward ending disease, but he believes individuals can help by contributing their health and genome data. He even suggests us working to modernize democracy so we can vote online. To maximize progress, everyone must have a role, not just the rich or those in the First World. And as artificial intelligence and robots improve, more and more jobs will be at risk. Zuckerberg says, “Now it’s time for our generation to define a new social contract,” where we measure progress not by growing GDP but by ubiquitous participation with the economy. Lending a hand can take many different forms. Zuckerberg says that universal basic income could unlock people’s attention to focus on solving big problems and contributing to society rather than merely trying to survive. Other suggestions he gave included affordable childcare so parents can continue working, flexible preventative healthcare so people stay healthy rather than generating more costs, prison reform to give low-level offenders a second chance and continuous education to make sure people stay employable as they age. Finally, Zuckerberg believes that we need to foster a sense of community, both locally with our neighbors so we can build support networks for individuals, and between nations to unite the globe around giant collective problems like climate change. A survey found that millennials around the globe predominantly identify their generation as “citizens of the world,” but Zuckerberg stresses that change won’t be made at the U.N. Instead, Zuckerberg sees each generation expanding the circle of who we consider “one of us” by becoming secure enough to care about others. The gravity of this fight seemed to wash over Zuckerberg near the end of the talk. The infamously stoic Zuckerberg began to tear up, describing how a high school student he mentored feared he couldn’t go to college because he’s an undocumented immigrant. Perhaps the most important thing that came out of the speech was Zuckerberg’s maturing perspective of how all this progress will be made. While his manifesto repeatedly offered deeper connection through Facebook as the answer, Zuckerberg never mentioned specific parts of the app he built in today’s speech. Maybe he’s realized that a product’s impact is defined by the virtues of those who use it. There’s plenty to fix within Facebook. But each of us must decide how wide we care to spread our circle of inclusion and opportunity. Previous ArticleWhich smartphone has the best camera? From food to followers – What is an Instagram bot? perv-city.com on Which smartphone has the best camera? COPYRIGHT 2017 - ODA LAB. ALL RIGHTS RESERVED.